Editorial boards everywhere are positively swooning over the dulcet crooning of a new boy band called The Climate Leadership Council (CLC). That’s right, the carbon tax band is back together! 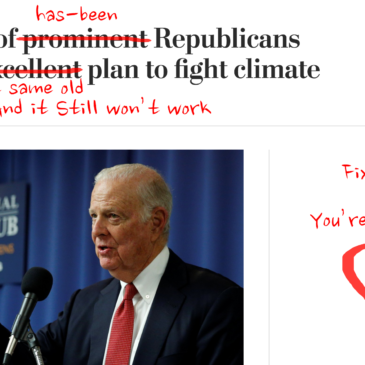 But as usual, for backers of a carbon tax, the editorial boards are missing a fundamental truth: Climate change will not be solved by a bipartisan consensus of old white men. And we know this is so because 1) We’ve heard all this before; 2) This isn’t a sincere attempt to solve climate change, it’s grandstanding by paid pundits; and 3) Sincere, workable plans to solve climate change exist, but they’re never written by bipartisan old white men from the pundit class. Let me explain: The CLC includes former Republican secretaries of state James A. Baker III and George P. Shultz, former chairmen of the Council of Economic Advisers Martin S. Feldstein and N. Gregory Mankiw, and former treasury secretary Henry M. Paulson Jr.
Clearly, this is a very serious idea, because it’s backed by so many old, economist white dudes, as the Washington Post is eager to explain (and please, try and contain your excitement). A group of prominent Republicans brought a refreshing message to Washington on Wednesday: Climate change is a threat that deserves serious attention, and the GOP should embrace smart ways of dealing with it. [The CLC] has a carbon emissions-reduction plan ready to go. And it is excellent. But their excitement is misplaced, and more to the point unhelpful because, first of all, we’ve heard it all before. Here’s the details, courtesy of an excellent piece at Vox. Slap a tax on all US oil, coal, and natural gas use, starting at $40 per ton of CO2 emitted and rising over time. All revenue from the tax would be completely refunded to Americans in the form of quarterly dividend checks. This tax would be imposed on all imports and lifted for all exports, to protect US trade competitiveness. And in exchange, many of the Environmental Protection Agency’s regulations on carbon dioxide would be repealed, including the Clean Power Plan. If that tune sounds familiar, it’s probably because people have been singing it for years, with various caveats and changes on price per ton, including/excluding exports and imports, and the famous Revenue vs Dividend debate. The problem with this old standard is that a carbon tax isn’t the be all and end all of climate policy. In fact, there’s a good argument that a carbon tax straight up won’t work unless it’s paired with other kinds of regulation. Now that the GOP can repeal all the anti-energy, anti-job regs–the Left offers to trade those regs for a carbon tax. It’s not like these Republican elder statesmen are unaware of those votes, or Norquist’s hammer lock on Republican tax policy. What this is really about is reviving the career of Baker, Shultz, Paulson and other Republican has-beens who are having trouble getting airtime. These people literally make a living by going on the cable networks and editorial columns to advocate a kinder-gentler form of conservatism. Heck, even Rex Tillerson used to sing this same song about supporting a carbon tax in exchange for erasing all pollution rules (and the Times et al ate it up then too). But the Republican support for a Carbon Tax was a lie then, and now that he’s Secretary of State, Tillerson has dismissed even the convenience of the fiction. This is a shameless attempt by a bunch of hucksters to trot out an old idea and get new TV time and column inches for it. And it’s insulting, frankly, that the Times and Post are falling for it when there’s real #ClimateAction going on all over the place outside the beltway. Where’s the coverage of Bold Louisiana’s plan for a just transition – including putting oil and gas workers to work repairing wetlands damaged by abandoned oil pipelines and canals? Or Oil Change International’s report on how to actually hit the goals of the Paris climate accord? Heck if you want to write about a carbon tax inside the beltway, why not cover the DC municipal carbon tax campaign? My point here is not to whine about how good ideas and organizers don’t get the coverage they deserve (ok, that’s a little bit my point. Because it’s aNOY-ING!). My better point is to re-iterate the lesson learned over and over again by climate activists: The Solution to Climate Change will Not Be Written in a Think Tank, Debated, Legislated and Enacted by Brave Bi-Partisan White Men Here to Save Us. Which 198 methods exists. The thesis of this project is that bold solutions to climate change and a just transition already exist, but getting them enacted will take more than pontificating and policy papers. It will take digital communications and base-building tools to disseminate and share ideas outside the established communications channels. In short, the revolution will not be televised, but it might be on Facebook live. And it will require direct action – in all it’s myriad forms: boycotts to protests to civil disobedience/resistance and lots of other things. So that’s what we do: Because there are at least 198 methods to solve climate change and create the future we want – but none of them look like this tired, dishonest, Republican carbon tax.